My Thoughts: I’m always looking for free Kindle reads, but I’m never really expecting anything great to come up. 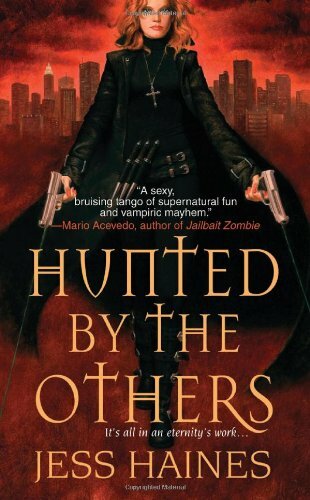 That all changed the day I received Hunted by the Others by Jess Haines . I didn’t read it right away, and I just happened to come across it in archives one day when I was looking for something new to read. All I can say is, I should have read it earlier! The world of private investigator Shiarra Waynest is fairly new to the idea of the Others – vampires, shifters, mages, etc. New laws have been enacted to help protect humans from their Other counterparts and vice versa. One such law is the Notice of Mutual Consent to Human/Other Citizen Relationship and Contractual Binding Agreement. Without this agreement being signed off on and filed in court, a human and Other are not allowed to be in any kind of physical relationship. If a human is bitten, scratched, or harmed in any way by an Other without this agreement being in place, then the Other can be prosecuted. Likewise, if a human is killed by an Other and this agreement IS in place, then there are no repercussions and the Other can even have access to the human’s personal property. Shiarra ends up having more knowledge of these contracts than she would like, as she had planned on limiting her exposure to Others as much as possible. Her firm's lack of money leads to her taking on a contract with the Mages, otherwise known collectively as The Circle. Unfortunately for her, this job may end up being her last. So begins Shiarra’s journey into the world of the Others. Along the way the reader is introduced to her best friend Sara, mage Arnold, vampire Alec Royce and werewolf Chaz, who’s also an ex-boyfriend. This old relationship will come into play, as well as a new “relationship” between Shiarra and Royce. I’m not going to tell you what that relationship is though. Guess you’ll just have to read the books and find out for yourself! I definitely suggest doing so, and don’t think you’ll be disappointed. These books are very quick reads, or they were for me, mainly because I became so engrossed in the story that I couldn’t stop reading! I'm excited to see where things are going to go for Shiarra and H&W Investigations.